Ly-6G/Ly-6C (Gr-1) in Mouse Spleno-cytes. Ly-6G/Ly-6C (Gr-1) was detected in immersion fixed mouse splenocytes using Mouse Ly-6G/Ly-6C (Gr-1) Monoclonal Anti-body (Catalog # MAB1037) at 10 ╡g/mL for 3 hours at room temperature. 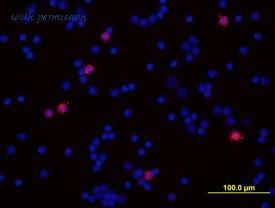 Cells were stained using the NorthernLightsÖ 557-conjugated Anti-Rat IgG Secondary Antibody (red; Catalog # NL013 ) and counter-stained with DAPI (blue). View our protocol for Fluorescent ICC Staining of Non-adherent Cells . Sca-1/Ly6 in Mouse Splenocytes. 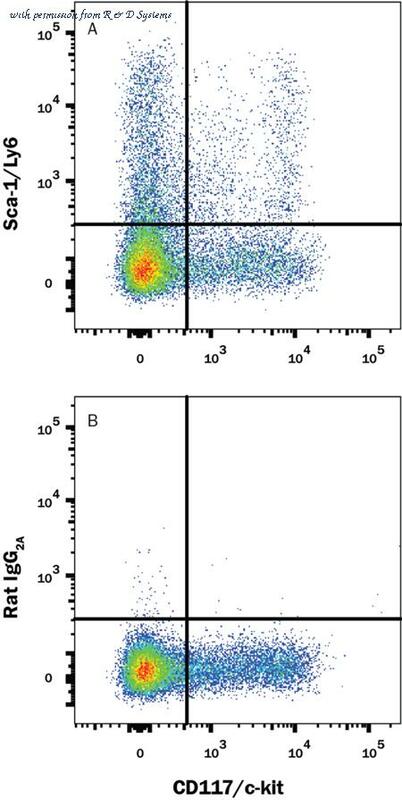 Sca-1/Ly6 was detected in immersion fixed mouse splenocytes using 10 ╡g/mL Goat Anti-Mouse Sca-1/Ly6 Antigen Affinity-purified Polyclonal Antibody (Catalog # AF1226) for 3 hours at room temperature. Cells were stained with the NorthernLightsÖ 557-conjugated Anti-Goat IgG Secondary Antibody (red; Catalog # NL001 ) and counterstained with DAPI (blue). View our protocol for Fluorescent ICC Staining of Non-adherent Cells . Detection of Sca-1/Ly6 in Mouse Splenocytes by Flow Cytometry. Mouse splenocytes gated on hematopoietic lineage negative cells were stained with Rat Anti-Mouse CD117/c-kit PE-conjugated Monoclonal Antibody (Catalog # FAB1356P ) and either (A) Rat Anti-Mouse Sca-1/Ly6 Monoclonal Antibody (Catalog # MAB1226) or (B) Rat IgG2A Isotype Control (Catalog # MAB006 ) followed by Phycoerythrin-conjugated Anti-Rat IgG Secondary Antibody (Catalog # F0105B ). Immunohistochemistry-Paraffin: Ly-6G/Ly-6C Antibody (RB6-8C5) [NBP2-00441] - Analysis of a FFPE tissue section of mouse bone marrow using 1:200 dilution of Lot A-1 of Ly-6G antibody (clone RB6-8C5). 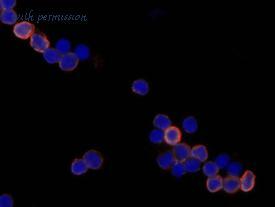 The antibody generated specific staining in a subset of cells in the tested section. 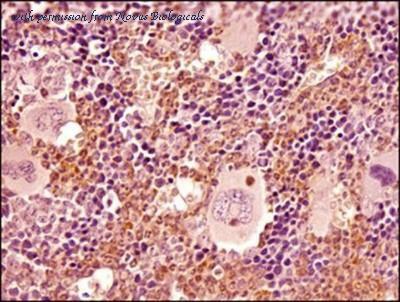 The neutrophils (identifiable from typical nuclear morphology) showed stronger signal than the neighboring cells.